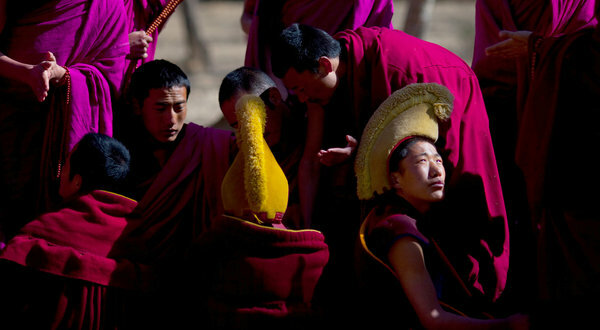 Tibetan monks at the Labrang monastery. Chinese security officials shut down cellphone service there for five days, one monk said. “We may be living far away from big cities, but we are well connected to the rest of the world,” said the 34-year-old monk, who, like most Tibetans who speak to foreign journalists, asked for anonymity to avoid harsh punishment. The technology revolution, though slow in coming here, has now penetrated the most far-flung corners of the Tibetan plateau, transforming ordinary life and playing an increasingly pivotal role in the spreading unrest over Chinese policies that many Tibetans describe as stifling. Rising political consciousness has found expression through a campaign of self-immolations that the authorities have been unable to stamp out. Since March 2010, at least 34 people have set themselves ablaze, the vast majority of them current or former Buddhist clerics, many of them young. Despite government efforts to restrict the flow of information, citizen journalists and ordinary monks have gathered details and photographs of the self-immolators, pole-vaulting them over the country’s so-called Great Firewall. In some cases, blurred images show their final fiery moments or the horrific aftermath before paramilitary police officers haul the protesters out of public view. News accounts, quickly packaged by advocacy groups and e-mailed to foreign journalists, often include the protesters’ demands: greater autonomy and the return of the Dalai Lama, the Tibetan spiritual leader, who has lived in exile since 1959. “Technology is facilitating an awareness that is rippling out faster than ever before,” said Kate Saunders, communications director of the International Campaign for Tibet in London. The awareness is influencing a generation raised under Chinese rule but skeptical of official propaganda that maligns the Dalai Lama or brands the self-immolators as terrorists. Even middle school students, thousands of whom took to the streets this year to protest the elimination of Tibetan textbooks, have become fluent in the language of resistance.